You are currently browsing the category archive for the ‘Jon Walker’ category. Chapter 5 of Jon Walker’s book, Breakfast with Bonhoeffer, is called “Jesus Central”. Bonhoeffer expressed concern that, when faced with a critical decision believers often argue from experience or opinion, leaving out any argument from Scripture. He says that when we give greater credence to experience or opinion, we reveal we don’t “seriously read, know, and study the Scriptures.” (62). Bonhoeffer said, “It’s not our heart that determines our course, but God’s Word.” (63). When we try to separate Jesus from our relationships, we deny the reality that the life of Christ is active within us. Since that life flows from Jesus through us to others, we actually have to block the flow in order to hide Jesus from our friends, family, or business associates. And this undermines the authenticity of those relationships (68). Bonhoeffer adds that the world is full of little gods who want to retain their hold over you, and that is why the world is so bitterly opposed to Christ. Some of those little gods are us: We refuse to relinquish our independence from Jesus, insisting we can receive forgiveness but then return to a life of independent living (68-69). May the Lord Jesus be the center of our lives! Do We Disregard the “Bloody Cost of God’s Grace”? Breakfast with Bonhoeffer is Jon Walker’s third book based on the life and works of German pastor and theologian, Dietrich Bonhoeffer. Here is a quote from chapter four, “Dishwater Disagreements”. The danger as we follow Jesus in the Kingdom is that we can slip off the narrow path, on one side sliding into a ditch of burdensome religion–what we call commonly call legalism–and on the other side sliding into a ditch where there is a presumptive disregard for the bloody cost of God’s grace, something Bonhoeffer refers to as cheap grace (52). 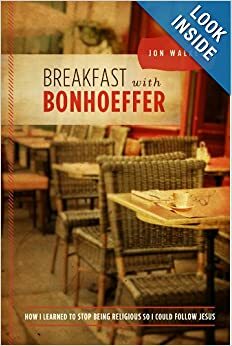 Breakfast with Bonhoeffer is Jon Walker’s third book based on the life and works of German pastor and theologian, Dietrich Bonhoeffer. His previous books are Costly Grace: A Contemporary View of Bonhoeffer’s “The Cost of Discipleship” (2010) and In Visible Fellowship: A Contemporary View of Bonhoeffer’s Classic Work “Life Together” (2011). …This morning Bonhoeffer reminds us that as long as we live with our delusions, we hinder ourselves from engaging the Kingdom of Heaven in the now (40). …This cheap grace, Bonhoeffer says, “is the preaching of forgiveness with requiring repentance, baptism without church discipline, Communion without confession, absolution without personal confession. Cheap grace is grace without discipleship, grace without the cross, grace without Jesus Christ, living and incarnate” (41). …we’re like an obese man who can understand the need to exercise, talk about exercise, and even plan to exercise, but who does not actually begin to exercise. It does him no good (42). …When we aren’t focused on what is real–on Kingdom reality–it’s like we have bipolar faith. We swing from belief to unbelief, from hot to to cold without ever being either. Jesus says our lukewarm faith makes him want to puke (46). …I borrow this question from Dallas Willard, who asks in his book, The Divine Conspiracy: Have you ever considered that Jesus is the smartest man in the world? Would the very fact that we follow conventional wisdom instead of the commands of Jesus indicate that we don’t believe he is? (50). Chapter two of Breakfast with Bonhoeffer is titled, “Double Vision”. …Most of us try to live with one eye on Jesus and one eye on the world. The only thing that does is give us double vision. Following Jesus down the narrow path and through the narrow gate into the Kingdom of Heaven with double vision is more difficult than a drunk trying to stay steady and straight while touching his nose or walking heel-to-toe down the line (33). …Every step is unstable and unsure. Everything you see is skewed by two images, neither one representing the exact likeness of that at which you are looking (33-34). …We stumble along, trying to walk a straight line but instead staggering between what is right and what we think is right. And we call this normal; we call this discipleship. I think about this when Bonhoeffer says we should have a singular vision on Jesus. We were never meant to walk with double vision…double vision is unfocused (35). …Jesus tells us again and again that we have to look past the things of the world into the eternal reality of the Kingdom (37). Dietrich Bonhoeffer lived a messy faith, believing Jesus continually brings us to choices that require total dependence upon him in order to take the next step. This means we stop being afraid of making mistakes, trusting that, if we mis-step, God sweeps us with his grace, is faithful to forgive, and will work things out to get us back on track because he wants us to move forward in our journey. Bonhoeffer teaches that a life of such extraordinary risk is expectation, not the expectation for any disciple of Jesus (Jon Walker, Breakfast With Bonhoeffer, 15).